Light up your religious events with our 6" white or yellow glow sticks printed with the Matthew 5:14 symbol. 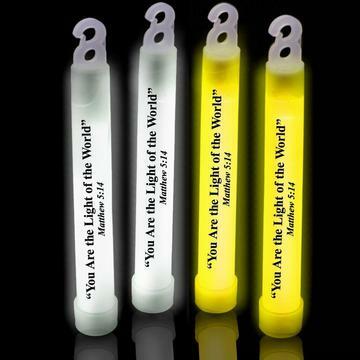 Light up your religious events with our 6" white or yellow glow sticks printed with the Matthew 5:14 symbol. Simply crack and shake and watch it light with a yellow glow. Our white or yellow glow religious sticks are sold 25 to a pack. Please order in increments of 1 pack.